This spacious, beautiful, multi-level home has 4 bedrooms, 3 full and 2 1/2 bathrooms, 3565 square feet, and a game room with ping pong and air hockey tables - sleeps 8 (2K, 1Q, 2T). 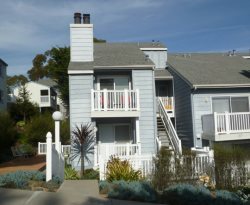 Located on the "top of the world" in Morro Bay, the views are incredible and can be enjoyed from any of the 3 levels and decks. This home includes a gas fireplace, gas barbecue, WiFi, and linens.